A reader from Australia sent this in from Victoria. Here we see that we are economic slaves. The government seeks to prevent travel if you owe anything. They should just take it all and call it a day. I though that you might like this, it is an editorial from Saturday’s Herald Sun in Melbourne, Victoria, Australia. 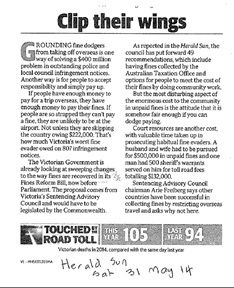 The current Victorian Government has floated the idea of restricting overseas travel for those people who have outstanding fines and warrants. This is in line with what you have recently outlined about Governments globally. I do know that you would be aware of this, but the Herald Sun is considered a conservative liberal ( Australian centre right Liberal, not American lefty liberal ) newspaper, and out current State Government is also a conservative Liberal government. It does appear that Governments are desperate for all sorts of revenue streams. Thank you for all that you do, and the education that your blog provides. I am very keen to purchase your planned Geometry of Time cycles and ECM books when they are published in due course.